Like many people, at least most non-Americans, I only tune into the Super Bowl for the adverts. I’ve been to several NFL games, had coaches explain the rules and I still don’t understand it, but every February I track down a feed from the US broadcaster to see the 30-second spots that cost companies £2.5 million a pop. This year there were the usual big brands and celebrity cameos. A stand-out example was Jaguar’s, starring Sir Ben Kingsley, Mark Strong, Tom Hiddleston and the rakish new F-Type Coupe, which played on the fact that baddies in Hollywood movies tend to be Brits. But the biggest surprise in over four hours of programming – and there sure weren’t many in the game itself – came from another car company: Maserati. Hardly mainstream, Fiat-owned Maserati has been a romantic and niche sportscar brand for exactly 100 years. Television ads have never been part of its repertoire. In 2012 it sold just 6,300 cars but the following year it beat its all-time record with 25,000. In 2015, with a very swish SUV on the way, it hopes to hit 50,000. It’s still not Audi (2013 global sales: 1.58 million units) but there’s a strong sense of confidence in Modena, Italy. To slot themselves in-between Coca-Cola and Microsoft, that is an understatement. 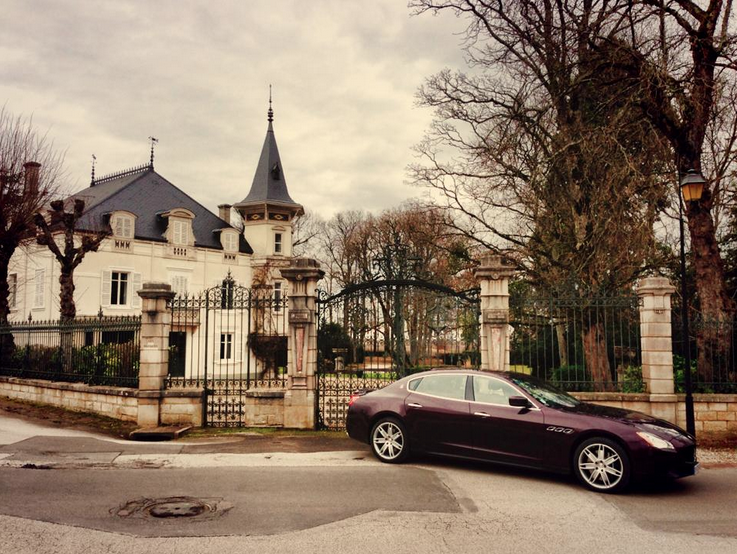 Therefore, when sliding into Maserati’s range-topping Quattroporte, my expectations were high. This car needs to match the Mercedes S-Class and Jaguar XJ on quality and ride. But it also needs to live up to the imposing Trident emblem on the grille. It needs to be a four-door Ferrari. The pick up location is Paris, a city celebrated for its discrete glamour, existentialism, nostalgia and art. It’s a reflection of what a Maserati should be: tastefully and intellectually intoxicating, with a soupçon of haughtiness. Mine is the colour of coq-au-vin, the spacious interior dark with few reflective surfaces. Is it too subtle? For some, yes, but this car has a reassuring whiff of old money about it. The Trident is really the only hint and what hides under the bonnet. That, the quadruple exhaust, and rear tyres that are as wide as tennis court rollers. The chrome-rimmed triple outlets on the body’s flank are the only retro nod, apart from the cool air of restraint. The silver seven-spoke rims are as gracefully simple as a Chanel suit, lacking the aggressive sculpture and nouveau shades of the equivalent AMG or XJR. Rare as it is for Italian stylists to resist shiny baubles, here they have succeeded. Cruising across the amber-lit Pont Alexandre III and following the route of the Tour de France, down the Champs Elysées, around Place de la Concorde, through the Louvre underpass and along the Tuileries gardens the Maserati absorbs the bumpy cobbled streets and confidently burbles between the wayward mopeds and stop-starting taxis. I park up in front of Le Meurice and toss the weighty silver and black key to the valet. The curb in front of the hotel is lined with tinted minivans and the ubiquitous S-Classes. In this company, the Maserati’s individuality sticks out like an Hermès case in a window full of Samsonites. It’s a return to form. In the 1980s and 90s Maserati had the evocative name but with all the attention to detail of the Fukushima nuclear plant. However, bolder shapes and much improved build quality are finally restoring Maserati to where it should be – perhaps, as sales attest, better than ever. The GTS boasts 530 horsepower from its Ferrari-built 3.8 litre V8, and it is every bit as glorious as you would expect from a Maranello-derived engine. The two-tonne Quattroporte is not a sports car, despite the Trident, and is most comfortably driven with respect but, when you want the world to know you mean business, click the ‘S’ button next to the excellent automatic gearshift and the exhaust crackle will make your hair stand on end. The engine is its soul, and this is a car with huge depths. The back end is very Audi-esque, as is the ergonomic interior, albeit without the brushed aluminium. The seats are handsome, each with the Trident stitched into the headrest and, reassuringly, the rear seats have very respectable legroom. The boot’s capacity is startling; a Maserati with space for a school trunk. Machine gun-totting Sicilians and their blindfolded cargo rejoice! Handsome though the package is, it lacks the eccentricity I yearn for in a Maserati. Something to link it to said mafia dons, jet-setting casanovas, European princesses and rockstars (Bono bounces around Dublin in a beaten-up last-gen Quattroporte) that have owned them in the past. The previous model divided opinion, and that’s what I liked about it. Some found it beautiful, others ugly, but then all great art should provoke a reaction. The 2014 car prompts noises of approval, but in my five days with the car no one tried to lick it or throw paint at it – unlike the time I negotiated Paris in a Ferrari F12. Then again, with the ambition to out-do Ferrari at the cash register seven-to-one, this car needs mass appeal. At £108,000 for this GTS model that is a big ask, but the Quattroporte’s strengths become apparent when you press the throttle. Its ride is more than fine, but slightly lacks the magic carpet feel of the Merc and the Jag. The toys are definitely out-shone by the S-Class. The pace is slightly slower than that of the XJR and it’s £15,000 more expensive. But, reassuringly, it’s the most engaging to drive. In order to appreciate this I head south east from Paris to Burgundy, down quiet A-roads and past vineyards and châteaux to the small village of Puligny-Montrachet, site of arguably the finest white wines in France. Like any good luxury car, the emphasis on one’s palette with Chardonnay is smooth and slightly buttery but, as in the case of the Maserati, you also want a little zest. Above the village, the Grand Crus of Montrachet are worth £20 million per hectare. Families in the village have owned these vineyards uninterrupted since the 1600s. Maserati, as their Super Bowl commercial promoted, have been in business for a long time too, keeping themselves to themselves and refining their trade, all the while beating competition from giant corporations. The difference is that vignerons of Puligny-Montrachet don’t feel the need to advertise.